Did you know that herbs and spices can give your food an amazing nutritional boost? I was excited to find out that the dried spices in my cabinet can provide the same (sometimes even more concentrated) benefits as fresh herbs. In this recipe, spices add both a yummy warm flavor and nutritional benefits . . . Cinnamon is known to keep blood sugar levels stabilized, ginger helps aid digestion, and turmeric is a anti inflammatory powerhouse. 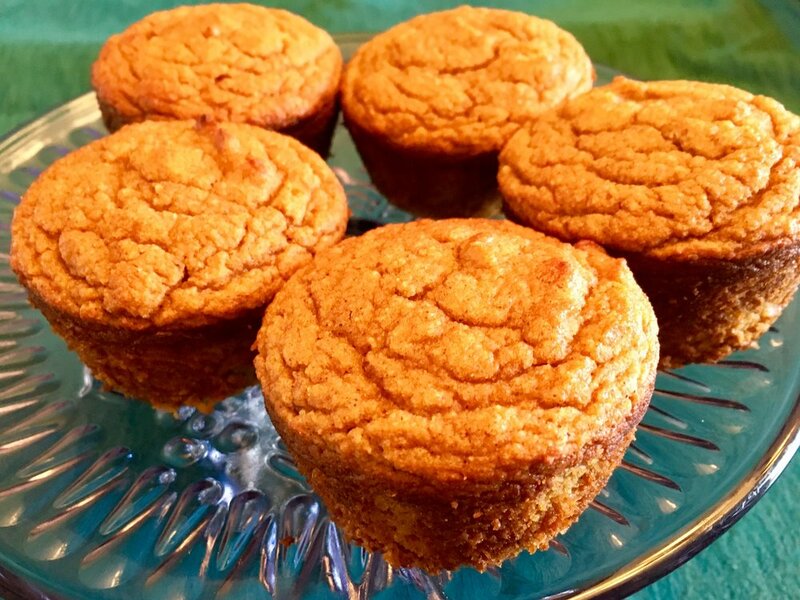 For these Sweet Potato Spice Muffins, we add all of this good stuff with nutrient dense sweet potato, the healthy fats in almond flour, and healing proteins in collagen - this is a muffin that will serve your body well. And it’s free from possibly damaging or inflammatory ingredients like gluten, dairy, or refined sugar. The best news of all . . . this was an absolute hit with my kids! I hope your family enjoys them as well. Preheat oven to 400 degrees and spray 12 muffin tins with coconut oil cooking spray. Combine dry (first 8) ingredients in a medium bowl, whisking until combined..
Add remaining wet ingredients (at room temperature) to bowl of a mixer and beat until smooth and combined. Add dry ingredients to the wet ingredients and mix until well combined. Pour batter evenly into 12 muffin tins (about 2/3 full). Bake on the middle rack for 25-30 minutes (or until toothpick in the center of the muffin comes out clean). Cool on wire rack for at least 5 minutes before removing from tin. **You can use leftover sweet potato mashed or skip the step of making your own sweet potato and use canned sweet potato puree. I buy a case and keep it on hand to sneak some veggies into my kids pancakes and waffles as well.